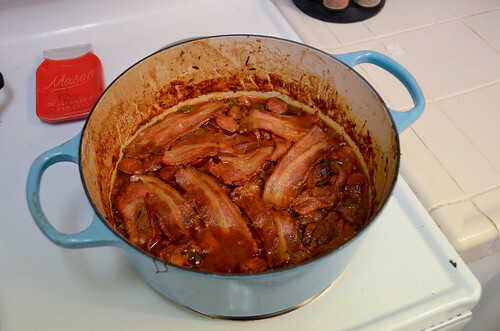 Continuing on a theme of both beans and French oven, rather than clean out the caramelized onions from the pot, I simply boiled up some beans for Franks & Beans from Joy the Baker. 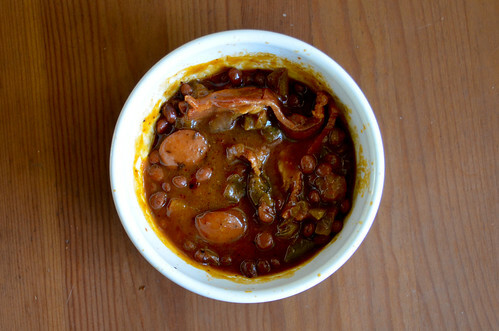 Caramelized onion infused pinquito beans? Yes, please. A second dish made in my beautiful baby/French oven, lol. This isn't, however, a dish you should start making at 8pm. I went to sleep at around 1am and had an alarm set for 2am to pull the pot out. The beans were fully cooked, but not as soft as I'd hoped. But nobody's got time for another 30 minutes to an hour of baking when it's already 2am! It's very tasty, lots of flavors going on. 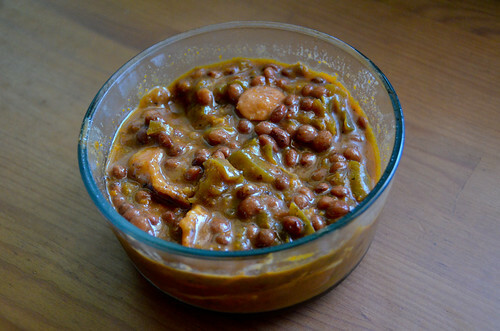 A really nice baked beans dish. I added an extra hot dog in and doubled the green pepper, just to get a nice portion of veggies. Also substituted canned pineapple for the fresh. Everything ends up tasting like the baked bean sauce, so I'm not sure it's necessary to go for fresh pineapple. Super tasty. It may look like a mess, but the French oven cleans up super well.